If you’re a crab cake lover, you know that finding a truly good Paleo crab cake isn’t easy. Most are loaded with breading, severely lacking in the crab department or fried to oblivion in unhealthy vegetable oil. But a GREAT crab cake – packed with big chunks of lump crab, donning a perfectly golden-brown exterior and just barely held together with creamy mayonnaise, egg and a little breading – is a delicacy that will have you pining for more. Since removing gluten from my diet, I’ve missed indulging in the occasional crab cake (especially the ones from the quaint little restaurant, Dada, in my home town of Delray Beach, Florida). And despite a number of attempts to recreate this seaside favorite, my Paleo substitutes of coconut and almond flour just weren’t creating the same texture as a genuine crab cake. Not long ago, I was making cauliflower fritters from some leftovers in the fridge. It was just steamed and then “riced” cauliflower, seasoning, eggs and a little coconut flour, formed into patties and then pan-fried. My husband, Jon, came in and said with a big smile “Wow, you made crab cakes.” As he took a bite, I waited for his response. “These are GREAT… but where’s the crab“. And then I got to thinking. Steamed cauliflower just might be the missing link to creating the perfect gluten-free, grain-free Paleo Crab Cake. And so it was! I hope you love this simple and delicious recipe as much as we do! As a special gift for Healing Gourmet readers, our friends at Thrive Market are giving away a 12 oz. jar of Primal Kitchen Mayonnaise – free for a limited time. It’s perfect in this recipe and countless more. Don’t delay – get your jar now! and “Low Glycemic Lifestyle.” I THOUGHT in that first purchase, I also became a member. However, I didn’t get 2 of the 3 books mentioned above that comes with membership. Please check on my status and let me know. I love the recipes for breads and tortillas so far and have done a kitchen makeover! (You CAN teach an old dog new tricks. I am 78 and my husband is 84!) 🙂 And also, how is “Food Cure” different from the ebooks I already have? Thanks. Thank you so much for your kind note. I love hearing from happy customers, and it is a special treat when I hear from ones who are so young at heart and still have a zest for learning! So, you have the Better Breads series. The Food Cure series is different – it breaks down the many areas of nutrition into modules and describes how nutrition influences aging and disease. It is extensive with a lot of research, but in “layman” terms. Then you’ll get the free books featured here at Healing Gourmet. These were fabulous! You can’t even taste the cauliflower but it made them great. They were so “fluffy”. I made a remoulade sauce that I got from Nom Nom Paleo and it went very well with them. Thank you for all you do. I love your site, emails, and recipies. Thanks so much for your kind comments and letting us know how the Paleo crab cakes turned out. I’m thrilled that you loved them! Stay tuned, we have some more great seafood makeovers coming up in the next few weeks. What kind of sauce was is? I’m interested in the crab-less crab cakes. Are you sharing that recipe?? I searched for it, but didn’t find it. Could you make the mixture several hours before? About Wilderness Family Naturals mayo – It is a good product (I used to use it all the time) but were you aware that their mayonnaise is no longer strictly paleo? I found this out because I have Celiac disease and watch ingredient labels like a hawk. The last time I purchased it, I re-read the ingredients and noticed that they are using barley vinegar, so I called them and asked if it is still gluten free. They told me straight out that it is contaminated with gluten. That little bit of barley is probably not significant to most people but if you have a serious condition that requires you to be strictly gluten-free, this is a food to avoid. Thank you for your comment. And I agree with you wholeheartedly. We have been buying Primal Kitchen mayo (by the case) since it came out. It really doesn’t get any better than that – homemade included! This is a great recipe had no crab , but what the crab, made it with salmon and it tasted really nice. You are a lady after my own heart! Your Paleo Crab Cakes Benedict sounds amazing. You can definitely make these ahead and keep chilled overnight. I have done this several times and they are perfect – even easier to work with. I’m curious if these would freeze well…what do you think? I tried these for dinner tonight and they were amazing! Thank you for such a creative twist on crab cakes. So glad you enjoyed them. I keep lump crab and frozen cauliflower on hand for anytime the crab cake craving strikes. Thanks for sharing and hope you visit us again. These crab cakes are delicious! I wasn’t sure about the cauliflower but surprisingly you can’t taste it. Thanks for the recipe! Holy heck! These were amazing! No one in the family knew that there was cauliflower hiding in these. They tasted so delicious and held together beautifully. I was skeptical given the amount of chunky crab I had and how big I made them. They had a gorgeous golden brown crust and plenty of flavor. Thanks for the fantastic recipe!! I have riced cauliflower. Can I use that? Do I have to steam it before I use it in the crab cakes? Rice cauliflower should work, but I haven’t tried it. You will definitely want to steamed before you add it or it will be rather crunchy. These sound delicious. 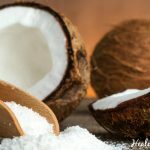 Can you substitute almond flour for the coconut flour? Absolutely! Almond flour is a great exchange for coconut flour in this recipe and I have had success with it many times (I’ll post my alternate printable recipe here later). Since almond flour is less absorbent, you will have to add a bit more than the 3 Tbsp. coconut flour called for. Add the 3 tablespoons, and then add by tablespoon to get the texture you like. I prefer to add about 1/4 cup and leave the “dough” a little loose and then pan saute in a deeper amount of healthy fat (1/4 cup of duck fat in a small cast iron pan is ideal!). This will give a more classic, golden appearance to your crab cakes. And by the way – the almond flour will aid in that too. Coconut flour is more spongy and has less potential to brown and create that golden, caramelized crust. Hope you enjoy and please let us know how you like the recipe! I followed the recipe exactly but I couldn’t form them, by the time I was done cooking them they kinda fell apart. Any suggestions? Other than that, it was delicious. I just made these for dinner. I used cauliflower rice and of course cooked it first. They were absolutely wonderful! I don’t have paleo mayo so just used regular mayo. I will definitely be making these again and again and again. I am wondering if this recipe calls for fresh crab meat or canned crab, which is it? THANKS! I am looking forward to trying this! Freshly cooked and picked over crab would be amazing if you can get it – typically I use prepared lump crab meat.